In seeking debt relief, many think taxes and bankruptcy are tied together. We’ve shared the four technical requirements to discharge old back taxes in Bankruptcy. And, we’ve touched on whether penalties assessed on unpaid back taxes are dischargeable in Bankruptcy. It’s imperative to caution our readers of some of special rules and issues that can tie up the Bankruptcy process and thwart filers from discharging taxes and/or penalties, despite the requirements being met. Looking for a fresh start, especially in regard to taxes and bankruptcy, is a common goal. Generally, you can get rid of credit card debts and unsecured loans in Chapter 7 or Chapter 13. You cannot, however, discharge loans or credit card debt that was used to pay off debts that are otherwise not dischargeable (tax or otherwise) in Chapter 7. In other words, you can’t change a tax debt that is “non dischargeable” because the 4 requirements of discharging tax debt in Bankruptcy are not met, into a dischargeable tax debt by paying it off with your credit card in Chapter 7. The opposite is true for Chapter 13, which allows credit cards or loan debts that were used to pay off non dischargeable tax debt to be discharged through the repayment plan. Example: Judi pays her taxes in full and has her CPA file her tax return on time every year. Judi takes a hit to her income in 2007 as a real estate agent due to the market crash. Judi continued to live a lavish lifestyle she became accustomed to during the glory days and finds that she owes $20,000 in back taxes for the 2008 tax year. Judi borrows $30,000 from her bank in 2009 to pay off back taxes and for other living expenses. Judi will not be able to get rid of the portion used to pay off the back taxes ($20,000) in a Chapter 7. Judi may be able to get rid of the $20,000 debt through a Chapter 13 Bankruptcy. Judi will likely be able to get rid of the rest of the loan used for living expenses in a Chapter 7 or Chapter 13 Bankruptcy. If the IRS has recorded a Notice of Federal Tax lien against you for a delinquent tax debt, then you may be able to get rid of your personal liability in Bankruptcy, but the lien will remain after your Bankruptcy discharge. Any lien placed on your real property for delinquent tax debt will remain after Bankruptcy; however, your personal liability for the debt will be extinguished. The result is that the taxing authority cannot go after your bank account or wages to satisfy payment of the tax debt (i.e. no personal liability), but you will have to pay-off the lien before you can sell your real estate with clear title. In a Chapter 13 proceeding that involves a 5 year repayment of your debts, if you fail to pay off the entire debt during your case, the IRS can seize the property you owned before filing Bankruptcy to cover the amount owed. 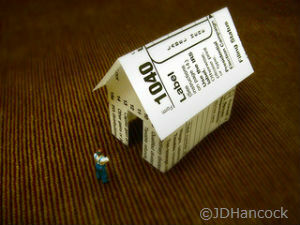 In a practical sense, the IRS seeks to recover payment from real estate and retirement plans. The IRS can continue actions related your taxes and bankruptcy case even though most other creditors have to stop any action. demand payment of an assessment. Are Property Taxes Dischargeable in Bankruptcy? We’ve touched on the dischargeability of regular income taxes and penalties associated with income taxes. And, we’ve covered some of the special issues associated with taxes and Bankruptcy. Now, we thought it would be wise to speak to property taxes. Property taxes aren’t dischargeable, unless they became due more than a year before you file for Bankruptcy. Even if you’re able to discharge your personal liability to pay the property tax, the tax lien will remain on your property after your Bankruptcy discharge. In a practical sense, therefore, the discharge won’t help you much because you’ll have to pay-off the lien before you can transfer the property with clear title. And, if you wait too long to pay, you may face foreclosure by the property tax creditor. In California, property taxes “run with the land” meaning that after a foreclosure sale, for example, the new owner now owes the delinquent property tax.